First, you will need to find a touch-up color that matches the color of your vehicle. You can look on the dash near the VIN number, the firewall, radiator core support, or owner's manual to find your vehicle's color code. 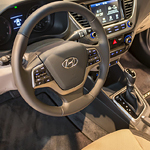 When exceptional vehicles come to our attention, our team at South County Hyundai of Gilroy enjoys passing the information along to our customers. 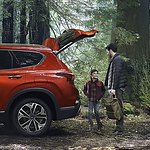 One of the more popular crossover SUVs available, the 2019 Hyundai Santa Fe has a lot to offer including impressive performance features. The new Santa Fe allows you to choose from two proven powertrains. The 2.4-liter inline four-cylinder GDI engine offers 185 horsepower. The turbocharged 2.4-liter four-cylinder engine is even more powerful with an output of 235 horsepower. All engines offer new eight-speed automatic transmissions. When you’re in the market for a car, the Hyundai Accent is a popular subcompact sedan to consider. We’re excited to show off the different interior features that are sure to impress you. The Accent has a surprising amount of space for passengers. This includes larger than average seats as well as plenty of legroom. You’ll also find trunk space that measures 13.7 cubic feet along with plenty of storage throughout the cabin. If you need added cargo, split-folding rear seats will offer you the necessary flexibility. Getting your car stolen is one of those awful life events we keep reserved for "others" in our minds. It happens in movies, on the news, but never to us. Unfortunately, car theft a lot more common than you might think. Even people who live in the safest neighborhoods can wake up one morning to find their garage or driveway empty or important belongings gone. Many individuals who have given the Hyundai Kona a test drive haven’t regretted the decision. This popular crossover vehicle, or CUV, brings the specialized Macpherson strut system as well as the Drive Mode select system to bear on your behalf. Individuals may appreciate the many virtues of the new Hyundai Kona specialized Macpherson strut design. This proprietary system makes use of a combination of stabilizer bars and special gas equipped shock absorbers to lighten and quicken this is already nimble vehicle.